Briony Mowbray addresses delegates at ACYMC. Image: Diocese of Parramatta. 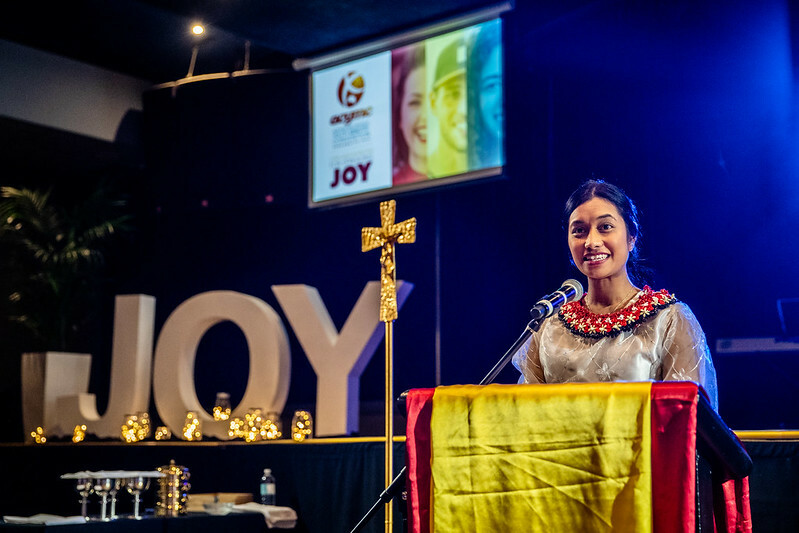 An atmosphere of astounding faith and deep discernment united the 400 delegates who descended on western Sydney for the three-day Australian Catholic Youth Ministry Convention (ACYMC), held between 21-23 September. The conference attracted delegates from across Australia and New Zealand who heard from a range of speakers and participated in workshops aimed at providing Catholic formation, training and education to those ministering to young people in the Catholic Church. The greatest thing a Catholic youth minister can do is be a “travelling companion” to the young. That was the message Bishop Vincent shared with the delegates. The conference, ‘Open New Horizons for Spreading Joy’, explored ways youth ministers can support young people in finding their place in the world. “The greatest service that a youth minister can do, is to be a travelling companion. The Church must become a travelling companion for the young. “I made it my goal to foster a Church where there is less an experience of exclusion but more an encounter of radical love, inclusiveness and solidarity. “It takes an entire church to journey with young people,” Bishop Vincent, Bishop of Parramatta, said. His diocese co-organised ACYMC with the Australian Catholic Bishops Office for Youth (ACBCOY). Malcolm Hart, Director of ACBCOY, who was key in organising the conference, told delegates, “It’s the grace and wisdom of everyone in this room that we can build the Church”. Malcom was grateful for the delegates’ presence and participation in wanting to shape Catholic youth ministry, saying “I thank everyone for being here and for those that have come from as far away as Perth, Adelaide, Townsville, Melbourne, New Zealand and other dioceses and youth groups. “It’s been a spiritually nourishing three days of discernment and thinking about the strategic direction of our Church and Catholic Youth Ministry,” Malcom said. ACYMC featured daily Mass and sessions were held on: Re-imagining Youth Evangelisation; Catholic Social Teaching; Vocational Discernment; Plenary Council 2020; Spreading the Joy of the Gospel; and Becoming Missionary Disciples. For Caitie Humphrys, Regional Coordinator of Marist Youth Ministry in Brisbane, attending ACYMC was “an unmissable opportunity to learn from others, but also just to reconnect with my own calling to youth ministry”. Echoing Bishop Vincent, Dr Debra said “it takes a community of faith” to journey with “a young person. “My role is to see what I can do to be the catalyst” in their faith formation Sharleen said. Jo Kennedy from Catholic Mission gave a timely update on the Plenary Council 2020 and reminded the delegates, “We want all young people in the Church to have their say” about the future of the Church. Attending from Perth was Theresa Beard, Coordinator of Sacred Heart Youth, Thornlie. She came to ACYMC in order “to take back to my other Catholic youth leaders what else is going on across Australia in youth ministry and what’s being engaged and to get some great ideas from other leaders and people involved in youth ministry. Flying in from the land of the long white cloud, was New Zealander Joey Bonnevie, Youth and Young Adult Ministry Program Leader for the Diocese of Auckland. “ACYMC is good to tap into as Australia does things on a much bigger scale than New Zealand and we can take that knowledge back home,” Joey said. Reflecting on ACYMC, James Camden, Director of Catholic Youth Parramatta, hoped the delegates were spiritually “nourished” by the convention. “ACYMC has been a really dynamic three days of learning, sharing and imagining what the future of youth ministry could look like in the Church. “We hope that the delegates have been able to use this time away from their front line of youth ministry to be nourished in their faith. World Youth Day Coordinator for Catholic Education Diocese of Parramatta, Mark Tuffy said ACYMC “is important” to young people and youth ministers. “We are talking about engaging the future Church, the young people are the future church. We accompany the young on their journey” towards faith. Cecilia Tuuhetoka, a parishioner from Holy Family Parish, Emerton in western Sydney was a volunteer at ACYMC. She attended ACYMC as a way to help young people “grow more in faith”. “We want to help the young people grow. Echoing her thoughts was her friend, Henanita Fatu, a secondary teacher at Xavier College, Llandilo and a parishioner at Our Lady Queen of Peace, Greystanes, both in western Sydney. “We love to get involved” in these events Henanita shared. “There are so many young people with needs, so we came to listen to those needs and take it back to our parish to help. Bishop Vincent Long OFM Conv at the first ACYMC 2018 Mass. Image: Diocese of Parramatta. Jesse Romeo saw ACYMC was a way to “gain more knowledge about Catholic youth ministry and transfer that knowledge back to our parish.” That knowledge will be taken back to St Joseph’ Parish, Brighton in Adelaide. Jesse is the Elected Leader of Brighton Antioch. Dr Bernadette Miles, a parishioner at Melbourne’s St Patrick’s Pakenham, and the director of Kardia Formation, addressed the delegates. Her message from ACYMC was “the whole of creation is under massive change, so conferences such as ACYMC are critical to support our spiritual leaders in remaining grounded and at the same time into evolving into all that we can become. “Support for our spiritual leaders, especially our young spiritual leaders is one of the most important pieces of work our Church can do at this time. ACYMC was held at Rooty Hill RSL, western Sydney.